For introductory courses in Financial Accounting. 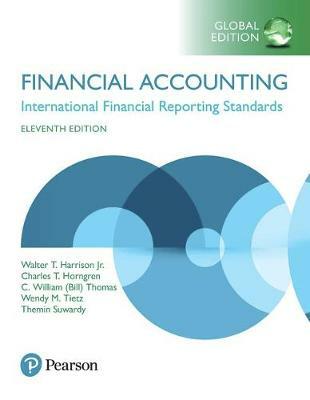 Financial Accounting gives readers a solid foundation in the fundamentals of accounting and the basics of Financial Statements, and then builds upon that foundation to offer more advanced/challenging concepts and problems. This scaffolded approach helps students to better understand the meaning and relevance of financial information, see its relevance within a real-world context, as well as develop the skills needed to analyse financial information in both their course and career. While maintaining hallmark features of accuracy, readability, ease of understanding, and a wealth of accessible algorithmic problems, the Eleventh Edition includes updated explanations, coverage, and ratio analysis with decision-making guidelines. These latest methodologies and technology ensure that students learn basic concepts in accounting in a way that is relevant, stimulating, and fun, while exercises and examples from real-world companies help students gain a better grasp of the course material.